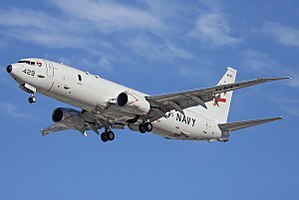 ^ "P-8A Poseidon milestone reached." Archived 20 November 2010 at the Wayback Machine AirForces Monthly, 13 August 2010. ^ Crowther, Stuart. "Senior RAF officer reveals MoD may be considering Nimrod replacement." Archived 24 April 2012 at the Wayback Machine STV Local, 18 April 2012. ^ "First pass approval for Orion replacement." Archived 1 September 2007 at the Wayback Machine The Hon. Dr Brendan Nelson, Minister for Defence, 20 July 2007. Retrieved: 16 September 2007. ^ "Address to the Air Power Conference." Archived 13 May 2012 at the Wayback Machine Minister of Defence (Australia), 10 May 2012. Retrieved: 12 September 2012. ^ Alegi, G. Dedalonews "Quattro ATR 72 da pattugliamento marittimo" (in Italian). Archived 15 May 2009 at the Wayback Machine l’Aeronautica Militare, 12 December 2008. Retrieved: 15 March 2011.